Sheridan 88 Blog: ValentiMes Day!! Here is another photographic blast from the past - an original "Kodak moment" if ever I've seen one. Before I go further though, let me assure you that I'm not revealing ALL my photos before the reunion slide show. Oh no. I've got plenty more of my own as well as from other classmates. You'll get to see them all at the reunion. But when you find some gems like the ones below, submitted by Mandy (Jester) Martindale, you can't fully appreciate them by just watching them click by in a slide show. There's no way. I'm telling you - as an "unofficial" nostalgia expert, I don't think I've ever seen a set of pics that have stirred up so many memories than these. 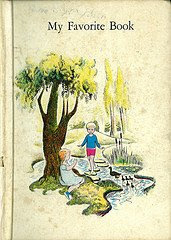 I mean, you can't help but be time-warped right back into 1979's fourth grade year when you look at these. So, let's have a look then. And remember - you have to click on each of these to enlarge them and study them. There is MUCH to be appreciated here. I'll try to talk you through it. This is Mrs. Rundell's fourth grade class party. Pictured above are Mandy Jester, Shari Rupe, Kim Derrick and Susan Averitt. Now just take a look... go on... what do you see? I see four ten-year-old girls giddy over goodies received in Valentine's Day bags. All but Shari are oblivious to the camera... they're too busy taking inventory of the 20+ cards that we all had to deliver out of obligation to everyone in our class. Whether it was the cootie monster or the cutie pie, you HAD to send them a valentine. Careful thought was given as we decided which card to use. You dare not make the mistake of sending someone an innuendoed Minnie Mouse card instead of a safe, neutral Goofy card. This could make the last 3 1/2 months of your fourth grade year pretty uncomfortable. Now take a look at Shari - check out her vintage Mickey Mouse ringer tee. Wait... I guess it wasn't vintage back then. Now what do you see in the background? 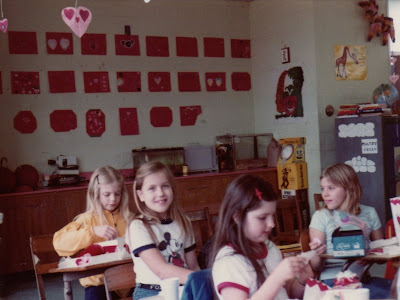 Yep - valentine crafts hanging on the wall... AND... is that a SLIDE PROJECTOR! If you're quiet, you can hear the small cooling fan humming in the dark as we watch film strips about the origin of Thanksgiving. I've got more on film strips for a later post. Let's move on. 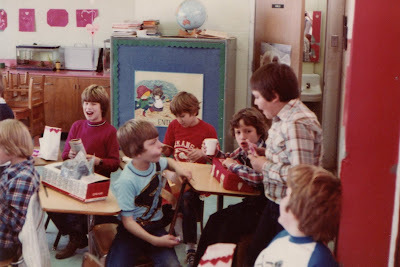 The photo above was taken from the same position, only the camera man (probably a mom) raised the camera to catch the other side of the room, which reveals another mom sitting smack dab in the midst of the kiddies... and some body's little brother too. Who invited him? 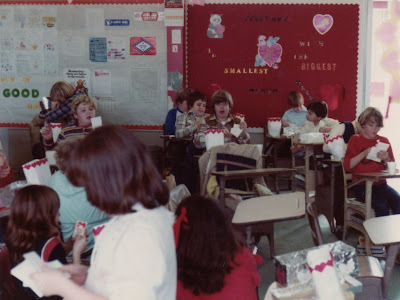 Notice everyone has matching Valentine sacks. [SIGH] So much for personal expression and creativity. Never mind though, Jody Wiggins and Robert McClung - like the rest of us - never judge a bag by it's decor - but by the delicacies waiting inside! I also see Kim Vailes at the bottom of the picture - you can just barely see her head with the tiara on top. Hmm. A tiara. Not sure about that... did Mrs. Rundell select a Valentine King & Queen? If so, then who was the King? And where is his crown? This is indeed a mystery. Another shot - again rotating the camera instead of raising it. It must've been unseasonably warm this February since the classroom door is propped open. In the first row on the right, by the open door is George Tompkins, Christian Sandoval, and Jason Moore. The next row, in the middle, has Michael Hix, Steven Coleman and Brett Cato. The far left row shows Robert McClung and Lee Shaw in the flannel shirt. That could be Pam Wells walking in front of the camera. And last, but not least... hey wait a minute - I think I see what's going on here - the guys are on one side of the classroom & the gals on the other. Interesting. So in the photo above we see, L to R, Lee Shaw, Jeff King, Scott Herron, Brett Epperson, Ricky Whitaker, Steven Coleman and Brett Cato. Nice hair boys! Can you say "MOTORCYCLE HELMET?" Couple of other observations... if you enlarge this pic, you can almost see the photographer's reflection in the mirror of the girl's bathroom. Since these photos belong to Mandy, the photographer is most likely her mother. Also, I'm seeing some decorated shoe boxes on many of the desks. 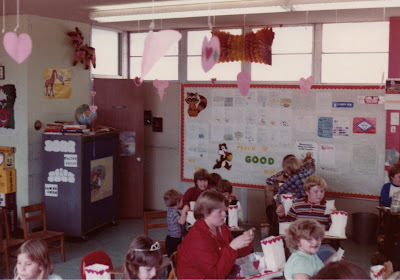 Were these the recepticles for the valentines... or the strict, uniform, non-variant and consistently decorated sacks? I'm confused! Could it be that this class was privy to TWICE the treats on this celebratory day of love!!?? This would be unfair to the rest of us. I demand an explanation! Someone from Mrs. Rundell's class please let me know!